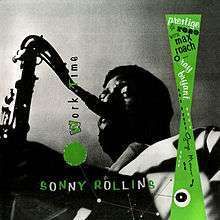 Work Time is an album by jazz saxophonist Sonny Rollins, recorded for the Prestige label, featuring performances by Rollins with Ray Bryant, George Morrow and Max Roach. The Allmusic review by Scott Yanow states: "The enjoyable outing may not be essential, but it is a strong effort." Author and musician Peter Niklas Wilson called it "one of Rollins's most brilliant sessions. In the opinion of many of the saxophone player's fans it is the equal of the epochal Saxophone Colossus recordings." ↑ Sonny Rollins discography, accessed October 7, 2009. 1 2 Yanow, Scott. Sonny Rollins: Work Time at AllMusic. Retrieved 7 October 2009. ↑ Swenson, J. (Editor) (1985). The Rolling Stone Jazz Record Guide. USA: Random House/Rolling Stone. p. 171. ISBN 0-394-72643-X.